If you've been hankering to see the new sci-fi, Prospect, the wait is almost over. Gunpowder & Sky just acquired worldwide rights to Zeek Earl and Chris Caldwell's film following its world premier at SXSW. 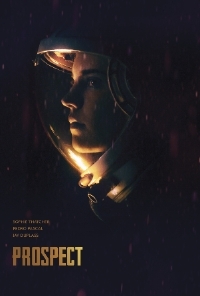 We've covered the film quite a bit here over the months, but Prospect centers on a teenage girl and her father who travel to a remote moon looking to strike it rich by harvesting a large gem deposit. Things don’t go as planned. The father and daughter are forced into a desperate fight to survive after they encounter hostile natives. Gunpowder & Sky will release the film theatrically in the U.S. later this year through its sci-fi label "Dust" while London based Independent will handle sales outside the U.S. and screen the film for buyers in Cannes. This is great news for sci-fi fans.